AppleScript droplet UI for Exiftool. Is there a better alternative to Tierprogramm? Is Tierprogramm really the best app in AppleScript category? Will Tierprogramm work good on macOS 10.13.4? 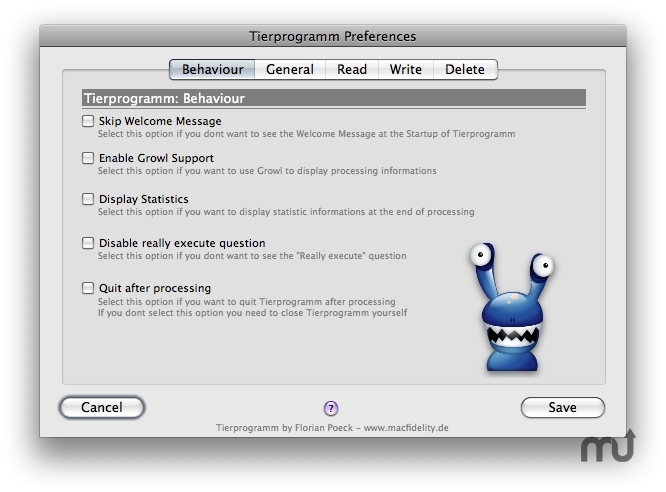 Tierprogramm is an AppleScript based freeware droplet User-Interface for Exiftool. It can be used to change Exif-informations inside jpg files. Tierprogramm is written by Florian Poeck and offered as it is. There is no warranty at all and usage it at your own risk. Support for Exiftool via MacPorts. Tierprogramm checks for usual Exiftool first, then for the MacPorts version. Feedback Welcome. Thx Alex G.
Mac OS X 10.5 or later, Exiftool, Optional: Growl. Tierprogramm needs a rating. Be the first to rate this app and get the discussion started! Installed version number of exiftool and exiftool via Macports is displayed in the General Tab now. Changed background & font color of the categories in the preferences window.